Wieke is a fashion designer who just graduated from the fashionschool ARTEZ in Arnhem, The Netherlands. 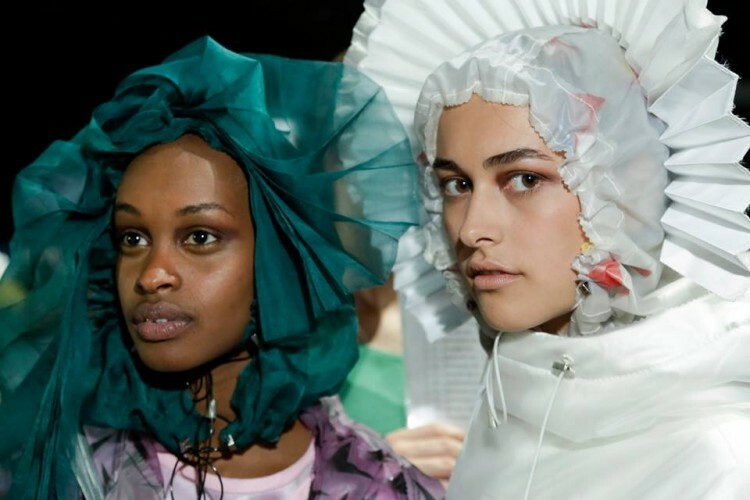 She cooperated on the Lichting show at Amsterdam Fashion week and really stood out for her amazing talent of designing and making a collection from the beginning to the end. She did an internship at famous fashion designer John Galliano, something that you can see coming back in her own collection. "My collection is located in the gray area between structured images and chaotic dreams. Inspired by the kaleidoscope I transferred forms like the square, triangle and the circle to prints and textiles, with the goal to confuse the viewer. As an example I work with materials that are mirroring and reflecting, so depth is suggested that in reality isn’t there. Or I pleat and fold flat fabrics so that the illusion of a 3-dimensional image is created based on 2-dimensional materials. In my prints I look for similar three-dimensional illusions by using perspective effects. I am trying to generate confusion through layering and transparency of prints and textiles. As a result, the viewer does not know where a print of garment begins or ends.In this way I try to create a world where feeling and ratios are balanced."